Notes:The Cocktail Party Effect by Killsadie is a completely different version and recording than on their full length, Experiments in Expectation. Brand New Unit is the only band that Tom or Pete of Modern Radio have not seen live. They were friends with Killsadie. 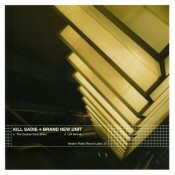 This record came out shortly after Killsadie moved to Seattle in 1999.